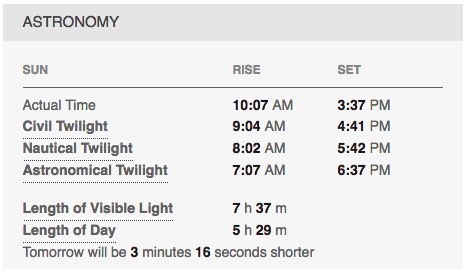 If you ever wondered about winter in Alaska, sunrise in Talkeetna starts at 10:07am today (December 5th) and sets at 3:37pm. Talkeetna is actually very low in Alaska, latitude-wise. Meanwhile in Utqiaġvik (formerly known as Barrow), the Sun neither rises nor sets today.